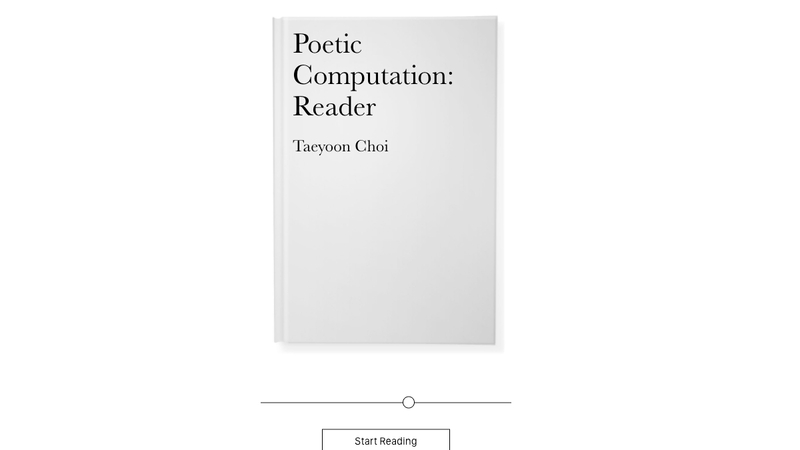 Poetic Computation: Reader is an online-book by Taeyoon Choi that discusses code as a form of poetry and aesthetic while raising ethical questions associated with it. The book is based on Choi’s lectures at the School for Poetic Computation, an independent school he co-founded in New York City. The book’s format is an extension of those themes—taking the form of an open source, digital reader designed and developed by New York-based studio HAWRAF and edited by Hannah Son. Exploring new ways for reading online, the book emphasizes accessibility, offering a range of inputs through which to engage with the text.